It’s Monday morning and Reggie and I have just completed our first delivery. As we pull away, I’m already on the phone with our next stop. We respond with gratitude as we quickly get to work. This day is no exception to the average day; the cornucopia in front of us easily amounts to over 600 pounds of healthy, fresh food. Dave’s comment, “it’s gonna feed a lot of people,” could not be more true. It’s not only a welcome reminder of just how important every pear and potato is, but it’s also a declaration of his commitment to our work. Dave is not our only supporter — the contributions come from every department. As we cull the produce and begin loading the truck, other employees stop to say hello and exchange a few friendly words. Over the 2+ years that fellow FRC Reggie has been going to the Needham Roche Bros. on a near-daily basis, it is clear that he is as much a part of their community as they are. And they are, without a doubt, an integral part of the Lovin’ Spoonfuls family. Conversations and our loading process wrap-up, and we are ready to head off to our next stop. We roll the carts back inside, with a few items left on board (a punctured tomato, a leaky gallon of milk). If Dave isn’t busy, we won’t make it far before he hollers, “leave it there! I’ll take care of it.” We shout our appreciation and goodbyes, and a few moments later we’re back on the road. 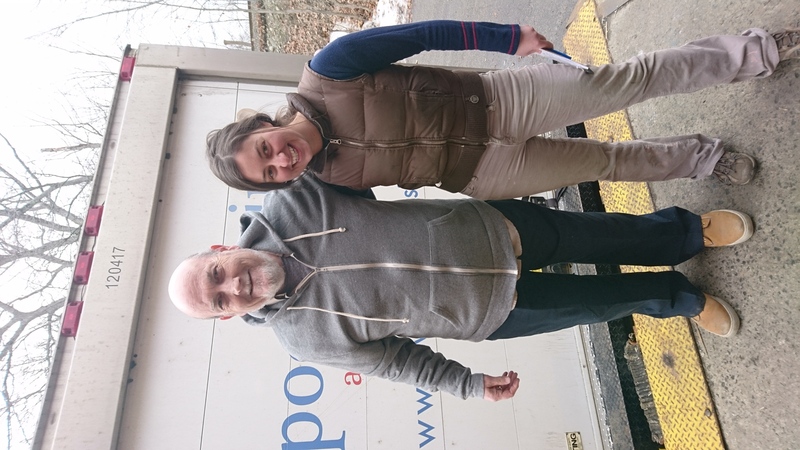 Around the same time that we are leaving Roche Bros Needham, Food Rescue Coordinators Jacob and Mary are heading to the Westwood location. Things work like clockwork at this store as well. 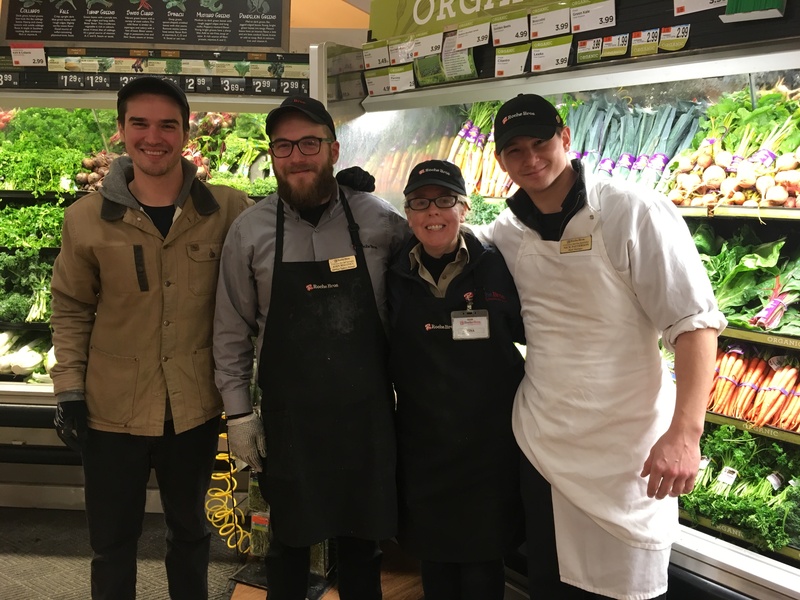 A call in advance is all it takes, and our friends in the produce department put out the word. Upon arrival, the FRC’s find the entrance barricaded with rescued food. Carts piled with boxes, and stacks of crates are just inside the vinyl strip curtain, as easily accessible as possible without being exposed to the elements. All aboard, and they’re off. Westwood is a relatively quick stop for Jacob and Mary, thanks to the time that has already been put into preparing for the pickup. If it weren’t for the collaboration of team members from each and every department, our stopping there would not be so fruitful. 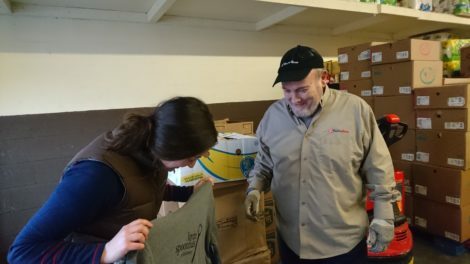 In Westwood, Tina Walty, who, like Dave, has been working with Lovin Spoonfuls since day one of our partnership with Roche Bros., confirms that “everyone is involved.” Food that is donated does not just go from a store shelf to a box; rather, it must pass a quality-check, and be scanned out. In the past, good food would often go into an organic waste dumpster or the trash. “Throwing things in the trash when it’s still edible was heartbreaking,” says Tina. These stores are just two examples of food rescue at its best. Given our 70+ vendor partners, you can imagine that there are dozens of extraordinary individuals working and advocating for us everyday. There’s Patti at Trader Joe’s in Brookline who will cut open a bag of oranges to pull out the one that’s rotten before setting the others aside for us. And Joe at Whole Foods in Charlestown who, upon our arrival, stops what he’s doing to retrieve prepared foods from a different part of the store. There’s Charlie at Star Market in Brighton who helped convince the produce and dairy departments to start donating (what is now hundreds of pounds each day!). The record-breaking numbers we have been reaching are a clear testament to the dedication of these individuals. The 60,000+ pounds we have been averaging each week is not made up of pallets of pumpkins; rather, it adds up slowly, one apple, one orange, one onion at a time, each picked off the shelf, each scanned out as to be accounted for, and each boxed and stored properly. All of this is done by the incredible men and women who work at these stores. 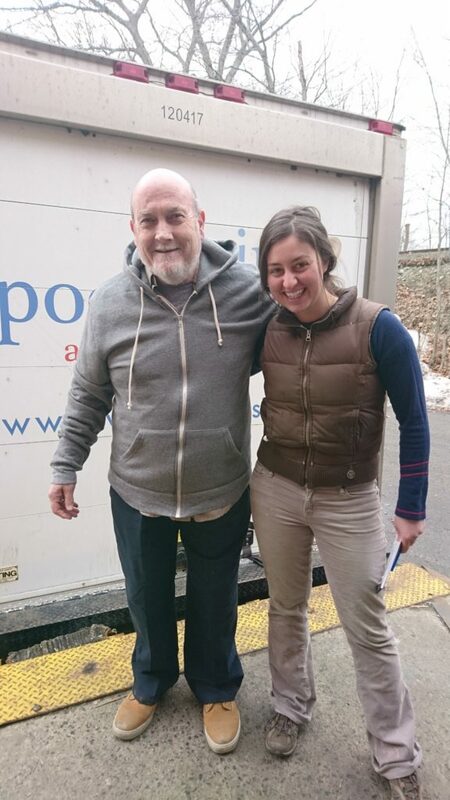 Dave, Tina, and all the others are the unsung heroes of what we do – the humble helpers who make our job possible. They don’t necessarily get to see the smiles or hear the heartwarming stories when handing out the food, but they understand the importance of their role in it, even on the busiest of days of the year. “It sure is!” I reply to Dave, who proudly dons a Lovin’ Spoonfuls hat. In fact, it’s gonna help feed 35,000 people this week. “Thanks for everything, Dave. And you have a Spoonfuls sweatshirt too, don’t you?” I asked as an afterthought, just to confirm. “Double XL,” he adds a moment later, a sparkle in his eye.